Oh happy day! I love when I discover that one of my favorite, special occasion, once-in-a-while treats can be made easily and with great results at home! 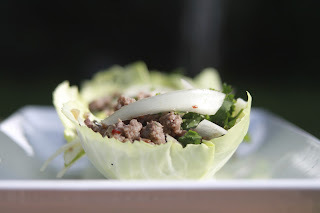 Larb has always been one of my favorite things to order at a Thai restaurant, when I am being schmancy and ordering appetizers. It seems like an appetizer to me, that is, but it is usually found under the salad portion of the menu. (maybe because the veggies in it are added at the end and not cooked?) If you have never had it, either make this version or go to a Thai restaurant (tonight!) and order it. You won't regret it. Despite the unfortunate-sounding name (to our western ears) the dish is to. die. for. Before I move on, I feel I need to give props to Laos. I discovered, in looking up some different versions of Larb recipes, that it is actually the national dish of Laos. Who knew? 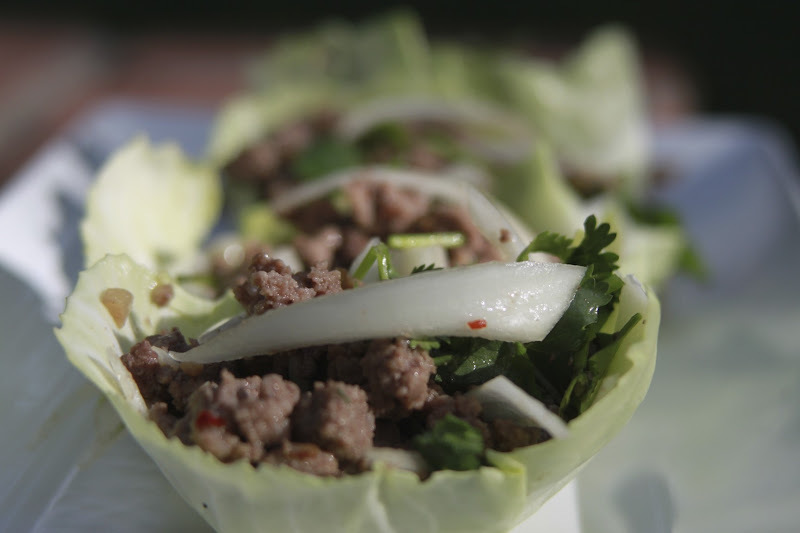 I haven't been to a Laotian restaurant (or Laos for that matter), but I know what I will be ordering if I ever do go! (To either a restaurant or the country, that is). I also learned that a portion of Thailand used to be Laos (Again, who knew? I am clearly not up to snuff on my Asian history), and that this dish is common mostly in that part of Thailand. Well. I am glad for that, because that means it made it into some of my favorite restaurants. 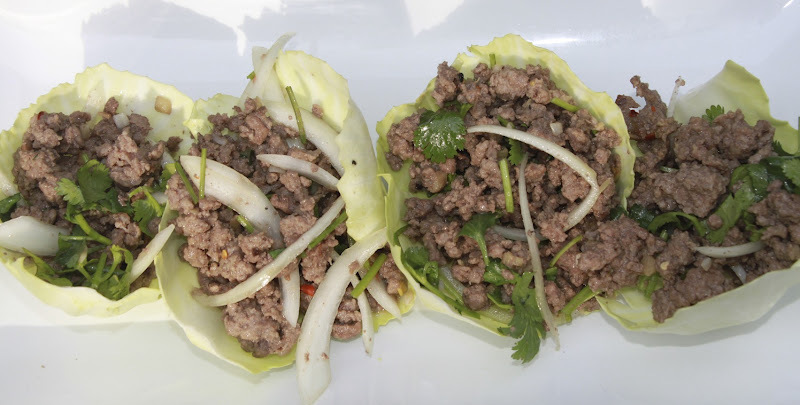 And if you live in town, go to Thai Pepper on Main Street and order the Larb. It's number 19 under the ... you guessed it... salad portion of the menu. Not only is the food fabulous, but so is the adorable older couple who own the place. Ahem. Back to the appetizer salad recipe at hand. Larb is a mixture of meat (I have seen it made with chicken, beef, turkey, and pork), lime juice, fish sauce, and cilantro and onions. All flavored with garlic and ginger. I found this recipe thanks to Rachel at De Ma Cuisine, who does the weekly cooking show and meal planner for Abundant Harvest. If you are an AHO subscriber (or just a lover of fresh delicious veggie-loaded food), check her out! She is adorable, her show is fun, and her recipes are yummy. Anyway, Rachel had included this on her weekly plan when we got cabbages in her box. 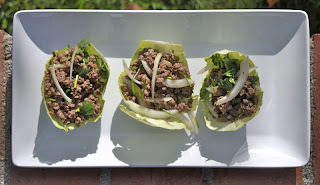 The recipe was listed as Thai Beef Cabbage Cups, which intrigued me. When I saw the subtitle (Larb), I was hooked. I followed the recipe more or less, but I added a little fresh basil, and forgot the peanuts (accidentally). It's perfect! I think I will try making it with turkey next time, since the beef tastes still rather beefy, and I think the turkey might take on more of the flavors of the garlic and ginger, but I am not complaining. I am in love! Heat a skillet over medium-high heat. Add 2 teaspoons of the sesame oil to the pan. Add the ginger and garlic and cook for one minute stirring constantly. Add the meat and cook, stirring to break it up, until it is done all the way through. Combine the rest of the sesame oil, sugar, lime juice, fish sauce, and crushed pepper in a large bowl When the meat is cooked, add it to the bowl along with the cilantro, basil, and onion, and toss well.